For those who want MAXIMUM solar power to recharge up the PowerHub 1800, this is your kit! Power your energy star fridge, freezer, lights, electronics and other home appliances during blackouts and emergencies and restore the standard of living for you and your family with the Earthtech Products Max 4800 Watt Hour Generator Kit with 4 265 Watt Solar Panels for Homes, Cabins and Remote Locations, a solar power generator system that utilizes both plug-and-play and electrical hard wiring capabilities. • Family will feel more secure and relieved during power outages and emergencies with the supplemental power this solar backup generator will provide. • This economical alternative to gas powered generators is both silent and free of fumes. • Battery boxes store 400 amp-hours of backup battery power to charge and run your essential appliances and electronics. • When the included 4 solar panels are exposed to direct sunlight, this solar power system for residential homes can be recharged in as little as 6 hours (2 times quicker than the Ultimate kit). • For your convenience, this solar power backup generator has multiple recharging options, including through the solar panels and a standard wall outlet. • When the 4 included solar panels are exposed to direct sunlight, this solar generator for homes can run up to 80 amps continuously during the day. • Can power multiple devices simultaneously through the 4 AC outlets in the PowerHub inverter charging system. • The full-feature LED display demonstrates live system monitoring so that you always know how much power reserve is left in the batteries, allowing you to plan accordingly. Shipping notes: This item will take approximately 7 Business Days for delivery from time of order. This Product May Be Eligible For A 30% Tax Credit. Visit dsireusa.org to view your specific state�s rebate program(s). No Payments + No Interest if paid within 6 months! Always be prepared with backup electrical power during emergencies, power outages and blackouts with the Earthtech Products Max 4800 Watt Hour Generator Kit with 4 265 Watt Solar Panels for Homes, Cabins and Remote Locations. This solar panel system with battery backup and an 1800 watt inverter can charge and run up to 1800 Watts at a time. The four included solar panels can collect up to 1,060 Watts, or 80 Amps, of power per hour, and which is then transferred into the four - 100Ah batteries. These batteries will then power your devices through the PowerHub inverter charging station. As opposed to gas generators that need fuel refills, emit fumes and are noisy, this solar power system for residential homes and cabins is silent, does not emit fumes and is virtually maintenance free. Window Air Conditioner (10,000 BTU) � Up to 6 hours of continuous use (during the day). **Please Note** The above calculations are based upon the individual items operating alone. Please consult with electrician or local building department if a DC Disconnect is needed with your installation. Manufacturer's warranty: Panel: 10 year limited product warranty on materials and workmanship. 25 year warranty on >80% power output and 10 year warranty on >90% power output. Q: Will this Solar Generator run my entire house? A: This Solar Generator is not a whole house system, whole house systems can run anywhere from $40,000 - $100,000 and is typically only for reducing energy costs on your electric bill and not for back up power. This kit is designed to run essential items such as Refrigerator, freezer, computers, laptops, lights, cell phones and other electronic devices up to 1800 watts at a time! So this kit is definitely the ultimate in back up power in case you experience a power outage. Q: Does this solar power kit for home use come with everything I need to get started? 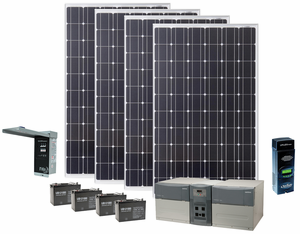 A: This Solar Generator comes with the solar panels, DC Combiner Box, Charge Controller, Inverter, Batteries and Solar Panel Cabling, you will only need purchase cabling at your local hardware store to run from the DC Combiner Box to the Power Hub 1800 since every application length is different. It is important to consult with the electrical supply store regarding the gauge recommended for the distance you want to run in order to avoid a voltage drop, we can also assist you with this information. Q: Do I need an electrician to install this emergency power solar generator? A: You do not need an electrician to install this solar power backup generator if you will be plugging your devices directly into the PowerHub. If you want to hook the system up to the electrical panel in your home, you will need to contact an electrician for installation. Q: Does this kit come with a mounting rack or hardware to install to a roof? A: Since every customer's application is different, we do not supply any mounting hardware. We often recommend for roof applications to purchase Z brackets from a local hardware store and they simply mount to the frame of the panel and roof. Many customers will also build a simple rack for the solar panels to place in the backyard when others will simply lay them out in grass. The options are endless. Q: Can the PowerHub Inverter and Battery Boxes be left outside? A: No they cannot. The PowerHub and Batteries should be kept in a cool, dry location where the temperature does not dip below 32F nor exceed 100F. Q: How long will it take to charge the solar backup generator kit in a wall outlet? A: It will take approximately 16 hours to fully charge the system from a wall outlet. Q: How long will it take to charge this solar generator with the included (4) 265 Watt solar panels? A: When exposed to 100% direct sunlight, it will take approximately 6 hours to fully charge this solar generator. Q: What types of ports does the inverter have? A: The inverter has 4 AC outlets on the front of the unit, underneath the LCD Display Screen. Q: Is the PowerHub 1800 computerized? A: Yes it is. The LCD digital readout screen exhibits input and output power, battery level information and the amount of power available to charge the batteries. Q: Will this solar powered generator power a heater? A: Yes, this will power a standard 600 watt portable space heater on low for approximately 8 hours. Q: Will this solar power generator system power a 110 volt sump pump and if so, for how long? A: Yes this will power a 110 volt sump pump. For example: A 1/2 horsepower, 110 volt sump pump would be able to run for up to 5 hours with this unit. *Please note: Cabling from DC Combiner Box to Powerhub not included. This cable can be purchased at your local hardware store. We do not include this cabling because customer's length requirements differ. The Grape Solar Racking System is ideal for installing four 60 cell PV solar panels on an asphalt shingle sloped roofs. This low profile racking system is built from aluminum and stainless steel for years of all-weather service. I was worried about the US grid going doen and having no power. I searched the web for a solar generator and I kept coming back here because they seemed to specialize in these and I was happy that i went this route because im all set up good to go. The folks here were great and assisted me with figuring out that this one was the best solar kit for my needs. I like to have more than less is why I went with this one.. Had a blackout since and it worked great for me. My wife thanked me for my manly buy. We live in a rural area where power goes out often. Also concerns of a more widespread power outage and grid going down. We have a back up gasoline generator but wanted this as an additional back up, especially if gasoline in short supply. Concept of the unit is very good. I was disappointed though in the lack of comprehensive instructions. Even though we got individual instructions for each component, we did not get a complete set of instructions for the complete system. We eventually hired an electrician to complete the installation. I would have like a very detailed comprehensive installation guide for the entire system and all components. Merchant Response:Thank you for your feedback! The installation instructions and operating guide are located in the Powerhub 1800 packaging portion of the bundle. Plus there are some helpful videos here to show you the general set up. If you are not familiar with connecting low voltage (12v) positive and negative wiring, or looking to do a more elaborate set up (i.e. connecting the output power of the generator to a sub panel) you should hire an electrician which should take a few hours or so for them to install. Let us know if you need any other assistance. I purchased the Earthtech Max 4800 Watt Hour Solar Generator. We have not installed it as we are saving it for an emergency. My question is about the batteries. Should they be charged regularly or may we leave them in the packing containers? The batteries should be installed in the Powerhub and plugged into a wall outlet or solar input, to ensure they are properly maintained. If you cannot keep them connected to a recharge source, they must be recharged every few weeks to a month in order to maintain a proper charge and ensure a full lifespan. Thank you for your inquiry! As long as the voltage and wattage is within the acceptable range of both the Powerhub and charge controller, then that will be fine. Feel free to provide the specification information to us beforehand, and we can confirm compatibility. Thank you! Is it possible to swap out the modified sine wave inverter for a pure sine wave one, as delicate equipment, like my cpap machine, could be damaged by modified sine waves? It is not an option to switch out the type of inverter in this kit. We recommend reviewing the Earthtech Products 6.5 kWh Solar Generator Kit as it includes a Pure Sine Wave Inverter: https://www.earthtechproducts.com/6500-wh-solar-generator-kit-1320-watts.html Thank you for your inquiry! Yes, you can configure this system to operate with an automatic transfer switch to act as an emergency power supply. Thank you for your inquiry! Will this system support power generated by wind? Yes, this unit can support a wind turbine. Thank you for your inquiry! Will modified sine wave hurt computers, phones or laptops? We recommend reaching out to the manufacturer of the products you are trying to power. Based on the brand and the item, their recommendation may vary. Thank you for your inquiry! How can you tell how much charge the batteries have at any particular time? Also will the unit shut down automatically if the power demand exceeds the amount of power the unit can supply? When batteries are fully charged they hold 4,800 watt hours or 400 Ah at 12 volts. If you plug something in that exceeds the inverter allowance it will just simply display an error code and you would simply unplug the high drawing item and restart the unit to clear the code. Please let us know if you have any other questions. 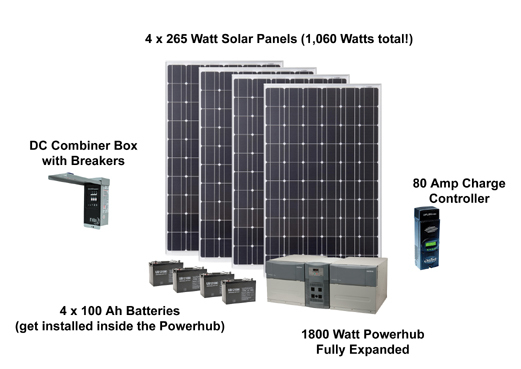 Can I have this system tied into my whole house to power primarily my air conditioning during multi-day power outages (I live in FL, so we get multi-day power outages every few years, but solar generation is not typically an issue). This unit can be tied into a backup generator sub panel and is best for all other items except for AC since AC tends to draw a lot of power compared to other appliances around the home. You would perhaps get only a few hours of run time for an AC with this system. To run AC you would need a more elaborate system such as this one: http://www.earthtechproducts.com/12-kwh-solar-generator-kit.html. Please let us know if you have any other questions. We do not offer installation services the Solar Generator Systems, but we are available to answer any questions an installer may have. Typically, an electrician is recommended for the installation of this kit. Thank you for your inquiry! I realize this product is primarily used for back up power for homes, cabins and off the grid living. But is it possible to use this generator to power a dryer and an electric range inside of a house? If so what size would be recommended for the dryer and electric range if that is all that will be put on the load side of the generator? Typically these products feature very large power requirements. I would recommend a larger system that features a larger maximum output. The Humless Off-Grid Series 12 kWh Generator would be a much better option: http://www.earthtechproducts.com/humless-off-grid-12000-wh.html Feel free to contact us at 877-548-3387 if you have any questions regarding this system. Thank you for your inquiry! The Earthtech Products Max 1800 Watt Solar Generator can be plugged in directly to a 110V AC outlet for charging/trickle charging. The best way to maintain the batteries is to keep them topped off via trickle charge or above 50% power. The system is designed for use indoors and should not be kept outside (except for the solar panels and cables). Thank you for your inquiry! is this able to use a wind turbine input. If not, do you have a product that would be a dual input meaning solar and wind power? The Earthtech Products Max 1800 Watt Solar Generator can indeed be used with both solar input and a wind turbine input. The Primus Air 40 Wind Turbine is a common add on to this generator: http://www.earthtechproducts.com/air-breeze-land-wind-turbine.html Thank you for your inquiry! Can you substitute the batteries with Lithium Ion? No, it is not recommended to substitute any different type of battery in this system. The best batteries for this system are the 12 Volt 100 Amp Hour Sealed Lead Acid Battery that can be found here: http://www.earthtechproducts.com/upg-100-ah-lead-acid-battery.html If you are interested in a system that utilizes lithium batteries, we offer the Humless 4.8 kWh off grid system that can be found here: http://www.earthtechproducts.com/humless-off-grid-4800-wh.html Thank you for your inquiry! Great questions! Choosing a Solar Back Up Power Generator unfortunately doesn't go by square footage. To figure out if this Solar Generator would be a good fit for your application we usually ask our customers what they are looking to run. For example an energy star fridge, a fan, 4 LED Lights, etc and we can lead you to the right unit. I can tell you this kit has been used on tiny homes before and customers were pleased with the result. With any solar generator system you do have be conservative with your energy usage as to not drain the batteries down to quickly. We can guide you through this easily by asking you a few questions! It would definitely be best if you give us a call at 877-548-3387 M-F 9am-5:30pm EST. We look forward to hearing from you. Is the Is generater capable of running the pump to an ingroung swimming pool? Good afternoon, the Earthtech Products Max 1800 Watt Solar Generator with 1060 Watts of Solar Power should be able to power the pump of an in-ground swimming pool. In order to answer your question with complete certainty, please provide the watt or amp draw of the pump in question. Feel free to reply via email to info@earthtechproducts.com, or by contacting us directly at 877-548-3387. We hope to hear from you soon! Yes, the Max 1800 Watt Solar Generator with 1060 Watts of Solar Power comes with (4) 100 Ah batteries as shown in the product photo. Thank you for your inquiry! Yes, you can use an extension cable with the 1800 Watt Solar Generator Kit with 1060 Watts of Solar. Thank you for your inquiry! It is indeed possible. I have had customers in the past attach castor wheels to the base of the Powerhub 1800, making it more maneuverable. As for the solar panels, they can be displayed by creating a treated wood rack. The customization is all up to you! And as always if you need any assistance we are just a phone call away: 877-548-3387. Thank you for your inquiry! How expandable is this system for more batteries and solar panels? The Earthtech Products Max 1800 Watt Solar Generator with 1060 Watts of Solar Power is capable of adding an additional 500 watts of solar power, or a max of 1500 watts of solar. The expansion kit can be found at the following link: http://www.earthtechproducts.com/5-panel-expansion-kit.html The battery boxes featured in this kit is designed to hold a maximum of four 100 AH batteries. Thank you for your inquiry!